It’s not like running your car’s mileage beyond its last scheduled oil change. Running a generator improperly can lead to unscheduled downtime, longer-than-expected routine maintenance downtime and an overall shorter service life for your equipment. 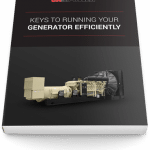 In this guide, we discuss some of the keys to keeping your generator performing at its peak and getting the most out of its service life.